INDIANAPOLIS, July 19, 2013 - The 2012 U.S. Women's Gymnastics Olympic Team, aka The Fierce Five℠, is among the accomplished gymnasts who will be recognized during the 2013 P&G Gymnastics Championships, Aug. 15-18 at the XL Center, and the USA Gymnastics National Congress and Trade Show in Hartford, Conn. As part of USA Gymnastics' 50th anniversary celebration, members of the USA Gymnastics Hall of Fame and the entire 2012 U.S. Olympic Gymnastics Team will be acknowledged during the P&G Championships, which feature the country's top gymnasts vying for national titles and berths on the U.S. National Team. Fans will get to see Fierce Five reunited with the other eight Olympians, and the alternates, for the first time since last fall's conclusion of the Kellogg's Tour of Gymnastics Champions when they help USA Gymnastics celebrate the team's accomplishments on Saturday, Aug. 17, at the XL Center. The members of the 2012 U.S. Olympic Team are: women - Gabrielle Douglas of Virginia Beach, Va./Chow's Gymnastics and Dance, McKayla Maroney of Long Beach, Calif./All-Olympia Gymnastics, Aly Raisman of Needham, Mass./Brestyan's American Gymnastics, Kyla Ross of Aliso Viejo, Calif./Gym-Max, and Jordyn Wieber of DeWitt, Mich./Gedderts' Twistars USA; men - Jake Dalton of Reno, Nev./Team Hilton HHonors (University of Oklahoma), Jonathan Horton of Houston/Team Hilton HHonors (Cypress Gymnastics), Danell Leyva of Miami/Team Hilton HHonors (Universal Gymnastics), Sam Mikulak of Newport Coast, Calif./University of Michigan, and John Orozco of the Bronx/Team Hilton HHonors (U.S. Olympic Training Center); rhythmic gymnastics - Julie Zetlin of Bethesda, Md. ; and trampoline - Steven Gluckstein of Atlantic Highlands, N.J./ETA, and Savannah Vinsant of Lafayette, La./T&T Express. Also at the XL Center, the 2007 Women's World Championships Team and women's gymnastics members of the Hall of Fame will be recognized for their achievements on Thursday, Aug. 15, with the men's Hall of Famers introduced on Friday, Aug. 16. 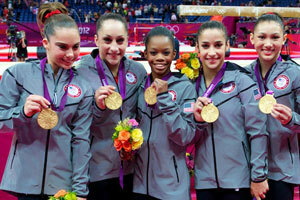 The Fierce Five and the 2007 Women's World Championships Team are members of the 2013 class of the USA Gymnastics Hall of Fame. The U.S. Women's Olympic Gymnastics Team made history at the 2012 Olympic Games in London by winning the United States' second-ever women's Olympic team gold medal in gymnastics and the first at an Olympics held outside the USA. Their runaway victory of more than a five-point margin came 16 years after Atlanta's Magnificent Seven captured Team USA's first team gold in 1996. In addition to the team gold, Douglas won the all-around gold medal; Raisman captured the floor exercise gold and balance beam bronze medals; and Maroney earned the vault silver medal. The 2007 Women's Gymnastics World Championships Team captured the 2007 World team gold medal in Stuttgart, Germany. The team's victory was the USA's second-ever team gold and the first outside the United States. 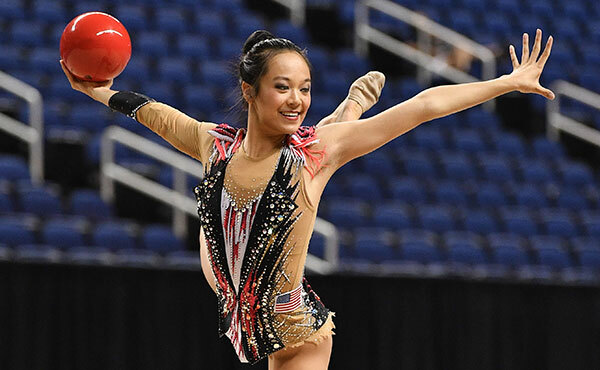 The team featured Ivana Hong of Laguna Hills, Calif., Shawn Johnson of West Des Moines, Iowa, Nastia Liukin of Parker, Texas, Samantha Peszek of Indianapolis, Ind., Alicia Sacramone of Winchester, Mass., and Shayla Worley of Orlando, along with alternate Bridget Sloan of Pittsboro, Ind. 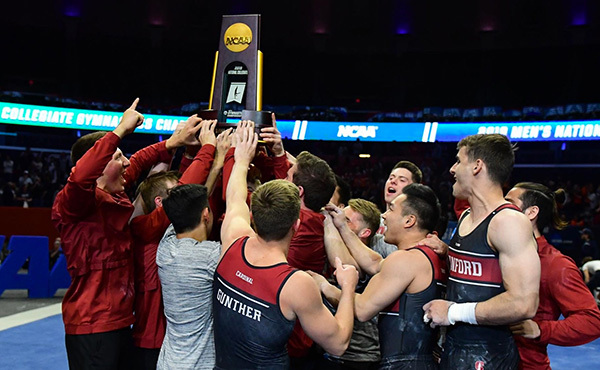 The team claimed six medals in addition to the team victory: Johnson's two individual gold medals (all-around, floor); Liukin's win on the balance beam and uneven bars silver; and Sacramone's silver on floor and bronze on vault. 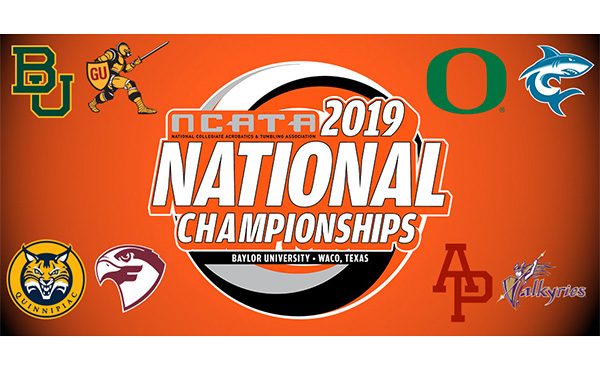 The replacement athletes who will be in attendance are: women - Sarah Finnegan of St. Louis, Mo./Great American Gymnastics Express, Anna Li of Aurora, Ill./Legacy Elite Gymnastics, and Elizabeth Price of Coopersburg, Pa./Parkettes National Gymnastics Center; men - Christopher Brooks of Houston/Team Hilton HHonors (Cypress Academy of Gymnastics), Steven Legendre of Port Jefferson, N.Y./Team Hilton HHonors (University of Oklahoma), and Alexander Naddour of Gilbert, Ariz./Team Hilton HHonors (USA Youth Fitness Center); and trampoline - Logan Dooley of Lake Forest, Calif./World Elite Gymnastics, and Dakota Earnest of Plains, Texas/Acrospirits. More information the 50th anniversary and fan activities will be announced in the near future. Aug. 15 - women's gymnastics, juniors at 1 p.m. and seniors at 7:30 p.m.
Aug. 16 - men's gymnastics, juniors at 1 p.m. and seniors at 7 p.m.
Aug. 17 - women's gymnastics, juniors at 2 p.m. and seniors at 7:30 p.m.
Aug. 18 - men's gymnastics, seniors at 11:30 a.m. and juniors at 6:30 p.m.
Tickets are on sale now. Single-session tickets range in price from $20 to $99. Multi-session packages are also available: men's package - all men's sessions (junior and senior), Aug. 16 and 18, $85-135; women's first day of competition package - junior and senior women's sessions, Aug. 15, $70-125; women's final day of competition package -- junior and senior women's sessions, Aug. 17, $85-135; and men's and women's package - senior women on Aug. 17 and senior men on Aug. 18, $85-135. All-session tickets, which range in price from $125-$395, are also on sale, and the top-priced ticket is for the best seat location and includes an autographed commemorative poster. Prices include facility fees and vary according to ticket location. Tickets are available through several different avenues: Ticketmaster.com; calling 1-800-745-3000; or the Public Power Ticket Office at the XL Center. For group tickets, please call 860-548-2000. For more information, go to usagym.org/events. 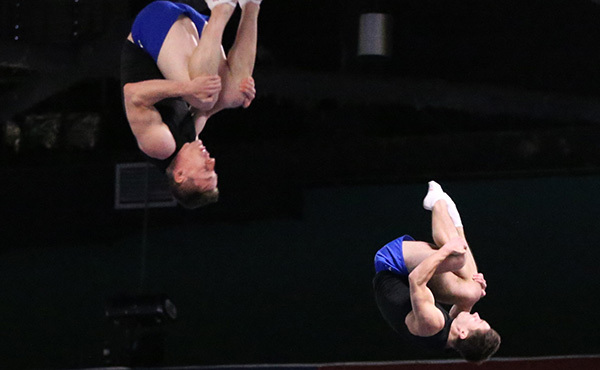 The P&G Championships, previously known as the Visa Championships, determine U.S. champions and the U.S. national team for the junior and senior elite levels. 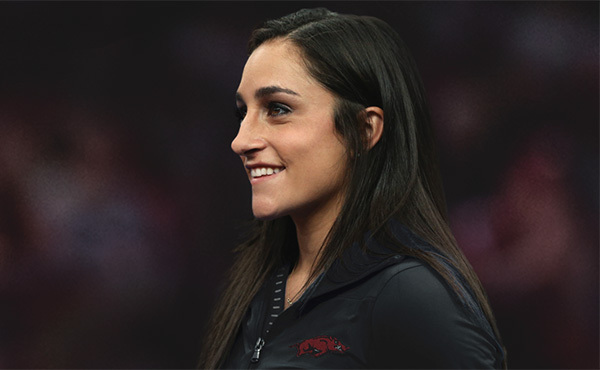 Orozco and Wieber won the men's and women's U.S. all-around titles, respectively, at the 2012 nationals. The roster of former U.S. all-around champions is a veritable who's who of gymnastics, including: women - Nastia Liukin, Shawn Johnson, Carly Patterson, Courtney Kupets, Shannon Miller, Dominique Dawes, Kim Zmeskal and Mary Lou Retton; and men - Paul Hamm, Blaine Wilson, John Roethlisberger, Mitch Gaylord, Peter Vidmar and Bart Conner. The U.S. Gymnastics Championships traces its history back to 1897 for the men and 1931 for the women. 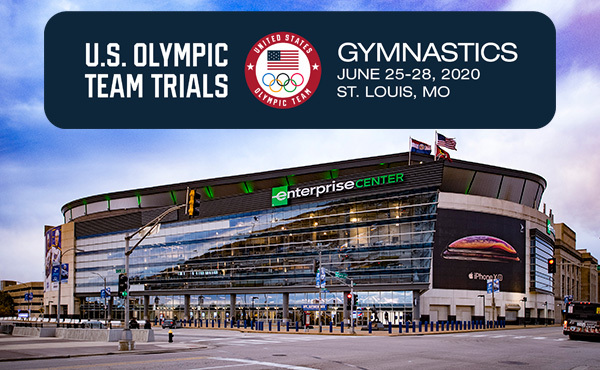 The 49th Annual USA Gymnastics National Congress and Trade Show is a three-day educational event open to the entire gymnastics community. Held in conjunction with the U.S. Gymnastics Championships, National Congress provides a unique opportunity for presentations, demonstrations and educational seminars on a variety of topics and a large exhibitor's hall with additional business opportunities. Hartford hosted both the national championships and USA Gymnastics National Congress and Trade Show in 2010. The Connecticut Convention Center. The Connecticut Convention Center, which has more than 205,000 sq. ft. of exhibition space, is the site for the USA Gymnastics National Congress and Trade Show. The facility offers an outdoor esplanade overlooking the Connecticut River and is connected to both the Hartford Marriott Downtown and the Connecticut Science Center. XL Center. The XL Center, managed by AEG Connecticut, will host two days of competition for both men's and women's gymnastics. The XL Center is home to the University of Connecticut Men's & Women's Basketball teams along with the Connecticut Whale, the American Hockey League affiliate of the New York Rangers. In addition to resident teams, the XL Center entertains millions of visitors annually with a variety of concerts, family shows, sporting events, consumer & trade shows. The XL Center is Connecticut's home for premier sports & entertainment. USA Gymnastics. Based in Indianapolis, USA Gymnastics is the national governing body for gymnastics in the United States. Originally called the U.S. Gymnastics Federation, the USGF was established in Tucson, Ariz., and opened its first office in the home of Frank Bare, the new executive director, in January 1963. The Board of Directors began the task of creating a viable national program for gymnastics in the United States. Due to the hard work of U.S. gymnastics pioneers - Frank Bare, Paul Fina, Harold Frey, Charlie Pond and Gene Wettstone, to name a few - the USGF replaced the Amateur Athletic Union as the sport's national governing body and gained membership in the International Gymnastics Federation in 1970. The USGF began doing business as USA Gymnastics in 1993. Trampoline and tumbling joined USA Gymnastics in 1999, just prior to trampoline's addition to the Olympic program, and acrobatic gymnastics became the newest discipline in 2002. During the last 50 years, the sport has grown by leaps and bounds. Today, approximately 127,000 athletes and professionals and nearly 2,500 clubs are members of USA Gymnastics. That number includes more than 96,000 athletes registered in competitive programs. Its disciplines include men's and women's artistic gymnastics, rhythmic gymnastics, trampoline and tumbling, acrobatic gymnastics and group gymnastics. For more information, log on to www.usagym.org.